President Bradley W. Bateman signs the President’s Resilience Commitment organized by Second Nature. Standing are (from left) Rick Barnes, professor of psychology and environmental studies and the Mary Sabel Girard Chair in Psychology; Sarah Sojka, professor of physics and environmental studies; Sara Woodward ’16, sustainability coordinator; Michael Maningas, assistant dean of students; and Karin Warren, Herzog Family Chair of Environmental Studies. 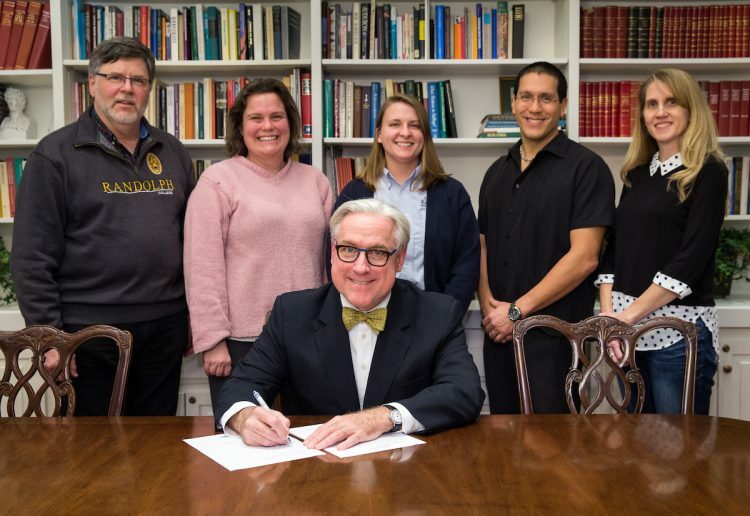 Today, Randolph College strengthened its commitment to environmental sustainability when President Bradley W. Bateman signed the President’s Resilience Commitment. 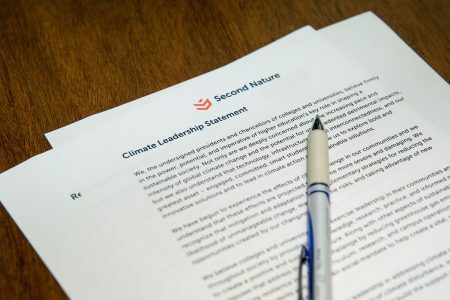 The document, organized by the nonprofit Second Nature, pledges that Randolph will develop a plan for climate resiliency. Per the agreement, the College will incorporate a joint campus-community task force and submit an annual review of the College’s progress. “The Randolph community has taken significant steps to ensure a sustainable future for our campus, and we must do our part in the national and international effort as well,” Bateman said. In December, Bateman also joined more than 170 colleges and universities in signing an open letter urging President-Elect Donald Trump and Congress to accelerate progress toward a clean energy future. The document, organized by a diverse group of higher education institutions and the Second Nature, calls on elected officials to support participation in the Paris Agreement, climate research, and investment in the low carbon economy. Karin Warren, the Herzog Family Chair of Environmental Studies, said Bateman’s decision to sign these newest commitments comes at a crucial time.